Shelton, CT – January 09th, 2018 -- JoshTorresDJ today announced its recognition as a winner of the esteemed 2018 WeddingWire Couples’ Choice AwardⓇ for Wedding DJ & MC in Connecticut. JoshTorresDJ was recognized as a recipient solely based on reviews from newlyweds and their experiences working with them. Award-winning vendors are distinguished for the quality, quantity, consistency and timeliness of the reviews they have received from their past clients. 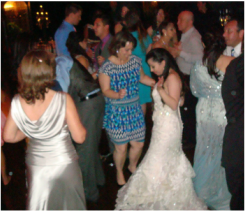 JoshTorresDJ is thrilled to be one of the top Wedding DJ & MC in Shelton on WeddingWire.com. JoshTorresDJ is a professional DJ and MC serving the state of CT. He hand picks his clients to guarantee 100% satisfaction. Multicultural weddings are his specialty. Being bilingual (English and Spanish) and having migrated from Costa Rica has shaped the way he approaches dance crowds from different ethnic backgrounds. Josh Torres is from Costa Rica, however, back in 1993 him and his family moved to USA. Keeping close ties with the Latin community as well as absorbing the American culture was a balancing act that Josh was able to accomplish. Therefore, when you need a DJ and MC who can cater to both sides of your multicultural wedding, rest assure that you've come to the right place. Take a look at all the reviews and you will find a pattern. Excellent service with special attention to the peculiar challenges of two (or more) cultures coming together to celebrate the union of their loved ones. Although Josh Torres started his DJ career catering to any event, he quickly realized that he had a special talent for weddings. Therefore, he began mostly working on weddings which became his specialty. Now with more than 100 weddings under his belt, he has truly become #TheWeddingSpecialist .